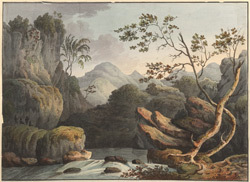 View of Borrowdale in Cumbria, Northern England. Borrowdale is a mountain valley and is said to be most beautiful valley in England, the landscape being dominated by the surrounding hills and mountains. A visitor to the area in 1772 described the area as ‘Beauty lying in the lap of Honour’. It is situated to the south of Derwentwater and is the gateway to the highest mountains in England- the Scafell range.